Caratteristiche: Realizzato in materiale ecologico di alta qualità, con buone prestazioni in vari ambienti complicati. Questo prodotto consente di collegare una sorgente audio digitale ottica toslink e suddividerla in due diversi dispositivi di ricezione. È possibile realizzare due dispositivi in ​​modo intercambiabile, senza necessità di collegare e scollegare i cavi in ​​fibra ottica, ridurre il danno dell'interfaccia di frequente spina e scollegare. Connettore terminale placcato oro 24K, anticorrosione e resistente, migliora la stabilità della trasmissione del segnale. Supporto per lettore CD, lettore DVD, console per giochi PS3, XBOX 360 o altri dispositivi audio digitali. .
1× Audio Switcher. DIY Chassis / Enclosure. Passive device,Each output with non-polar capacitor isolation, to prevent interference with each other and sound effect, pure DIY manual welding. Stereo 1-IN-4-OUT RCA Audio Splitter/Switcher. Hi-Fi Tube Amplifier. Integrated Amplifier. Digital Amplifier. Headphone Amplifier. 1× Audio Switcher. Speaker Protection Board. EL34 Tube Amplifier. 300B Tube Amplifier. USED CONDITION. TESTED & WORKING. RCA phono adaptors for splitting and combining audio signals. Channel separation: 60dB @ 1kHz. Input: 3 x stereo RCA. Connections via nickel plated RCA sockets. Output: 1 x stereo RCA. Enables the connection of 3 stereo audio sources to the stereo input of an amplifier. Extracts audio from a HDMI source to SONOS PLAYBAR/PLAYBASE (up to 5.1 Dolby Digital). Supports HDMI 4K, 3D & 1080P resolution images, Dolby Digital 5.1 Audio Output. Audio cables not included. Simple plug and play. Use this to switch between 2 audio outputs (i.e - speakers & headphones) from 1 input source. Or switch between 2 audio input sources (TV/PC) to one output source (i.e-SURROUND SOUND). Included is a Velcro sticker to mount the switch. Channel separation: 60dB @ 1kHz. Connections via nickel plated RCA sockets. Input: 3 x stereo RCA. Output: 1 x stereo RCA. Enables the connection of 3 stereo audio sources to the stereo input of an amplifier. Mono plug to two mono sockets. Connector B: 2 x 6.35mm 1/4" jack sockets (mono). Connector A: 6.35mm 1/4" jack plug (mono). 6.35mm 1/4" jack adaptors for splitting and combining audio signals. The small form factor design makes it suitable for installation into virtually any location, regardless of space constraints, while still providing a lossless audio signal. 1 - Toslink (SPDIF; Optical) Female. 3.5mm splitter cable, with 2 male and 1 female jack plug, is used to connect headsets with 1 jack plug to laptop / PC with separate aux port for headphone and microphone. 1 x 1m Aux Splitter Cable. Note: the female port is only compatible with OMTP standard headsets (e.g., most Android phone earphones), not compatible with CTIA standard headsets (e.g., not working with iPhone, Beats headsets). Enables the connection of 3 stereo audio sources to the stereo input of an amplifier. to one amplifier. The sources can then be selected via the push buttons on the. 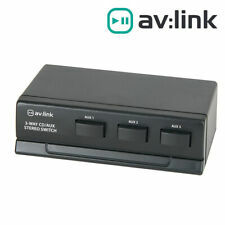 This compact switcher box allows connection of up to three stereo sound sources. One female 3.5mm (1/8") stereo mini plug on one end and two Stereo male 3.5mm jacks on the both ends. One Mic and one Earpiece. 1 x 3.5mm Splitter. Two lines in two colours: Red and Black. Nickel-plated connectors for highest signal transfer rate and resistance in corrosion. This is switching unit has been used but is in very good condition. 6-way (12 channels L R) allowing you to switch between up to 6 sets of speakers in any combination. You can switch on or off as many speakers as you want. It converts Coaxial or Toslink digital audio signals to analog L/R audio. 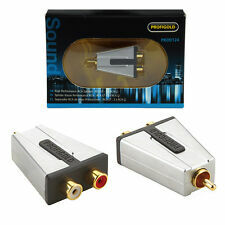 Converts Coaxial or Toslink digital audio signals to analog L/R audio. Input Audio: Coaxial or Toslink digital audio. Input audio connector: Toslink、1XRCA(Coaxial). Connector B: 2 x mini jack sockets, stereo. 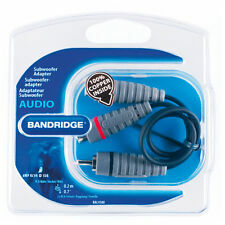 Connector A: 3.5mm mini jack plug, stereo. 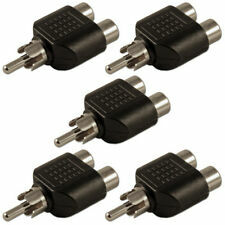 3.5mm mini jack adaptors for splitting and combining stereo audio signals. Type: Audio & Video. Type: Audio Splitter/Switcher. Weight: 80. It converts Coaxial or Toslink digital audio signals to analog L/R audio. 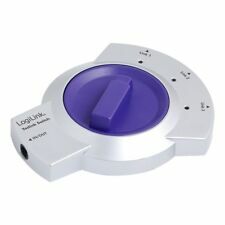 Converts Coaxial or Toslink digital audio signals to analog L/R audio Supports sampling rate at 32, 44.1, 48 and 96 KHz. 24-bit S/PDIF incoming bit stream on left and right channels. Maxview Optical Toslink Splitter for Digital Audio Splits 1 Signal to 2 Ouputs. Mono plug to two mono sockets. Connector B: 2 x 6.35mm 1/4" jack sockets (mono). 6.35mm 1/4" jack adaptor for splitting and combining audio signals. Gold Plated Connectors Fully Moulded Lead Stereo Lead Dual Sockets. Connector A: 2 x RCA phono female sockets. Connector B: RCA phono female socket. Suitable for iPods or other MP3 players on the market, this product is an inline sound enhancer that attaches to any audio source via the 3.5 mm headphone jack. SoundUP is the ideal device to improve the sound quality of compressed MP3 files, providing rich, CD quality sound from your MP3 player. Connector B: 2 x 3.5mm mini jack sockets, mono. Connector A: 3.5mm mini jack plug, mono. 3.5mm mini jack mono splitters. 1 - Toslink (SPDIF; Optical) Female. The Digital Toslink/Optical SPDIF to RCA Audio Converter lets you convert a 2-channel Digital Coaxial or Toslink/Optical SPDIF input signal into an RCA analog stereo output. RCA phono adaptor for splitting and combining audio signals. Connector B: 2 x mini jack sockets, stereo. 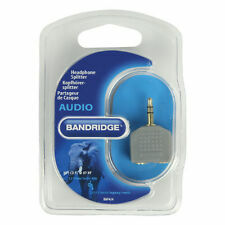 3.5mm mini jack adaptor for splitting and combining stereo audio signals. Application: For new notebook, tablet, smartphone, netbook and so on the audio port (microphone MIC headset) is made into one, that is, only one audio interface, use this product conversion, you can connect two 3.5 plugs separate computer Headphones (microphone MIC headphones). 1 x 3.5mm Splitter. One male 3.5mm (1/8") stereo mini plug on one end and two Stereo female 3.5mm jacks on the both ends. Nickel-plated connectors for highest signal transfer rate and resistance in corrosion. QED SS20 2 Way Parallel Speaker Switch is an ideal opportunity to allow connection for switching between two sets of stereo speakers, connected in parallel, to a stereo amplifier’s output.